The news stories tell us that Sunday February 7, 1904, was a brutally cold and windy day. In Baltimore, a single spark was destined to change the face of the city forever. 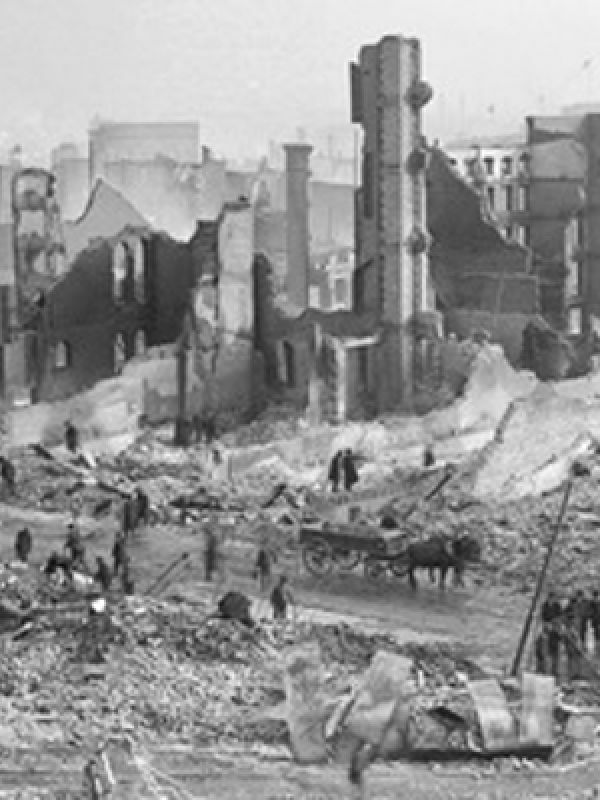 That spark ignited a blaze in the warehouse of the John W. Hurst Company at German (now Redwood) and Sharp Streets. Shortly after 11 AM, the building was engulfed in flames. By noon, the fire had spread to other nearby buildings, and the wind was driving it still further. Fire companies from Washington, Pennsylvania, and New York rushed to join the battle, but it was too late. The flames pounced and dove like hungry animals, devouring every building in their path. The entire downtown was an inferno. Towards evening, it was obvious that Little Italy was in danger. Residents began fleeing eastward toward Patterson Park, taking whatever belongings they could carry. It was then, most accounts agree, that the stage was set for a miracle. Many of the parishioners refused to leave their homes and belongings they had worked so hard to earn. Instead, they gathered on the east bank of the Jones Falls and prayed top God to spare them from the flames. Someone in the crowd cried out, “Saint Anthony protect us!” and others took up the cry. A few men present rushed back to Saint Leo’s and returned with the statue of Saint Anthony and a vessel of holy water. As Father Monteverde raised his arms in prayer, they made a solemn vow: If their homes and church were spared from the fire, they would hold a yearly festival in honor of Saint Anthony. At about 6 o’clock Monday morning, a strong wind came up and blew the flames the other way. 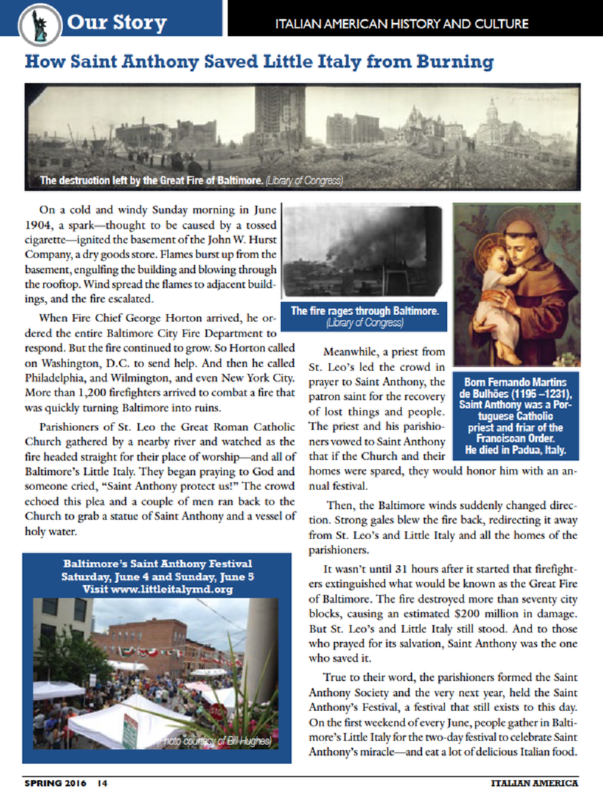 Efforts to clean up the downtown had not even begun when, in gratitude, the people of Saint Leo’s founded the Saint Anthony Society and started the celebration which began with a Solemn High Mass. Then, practically everyone who could walk, joined in the procession through the streets of Little Italy. 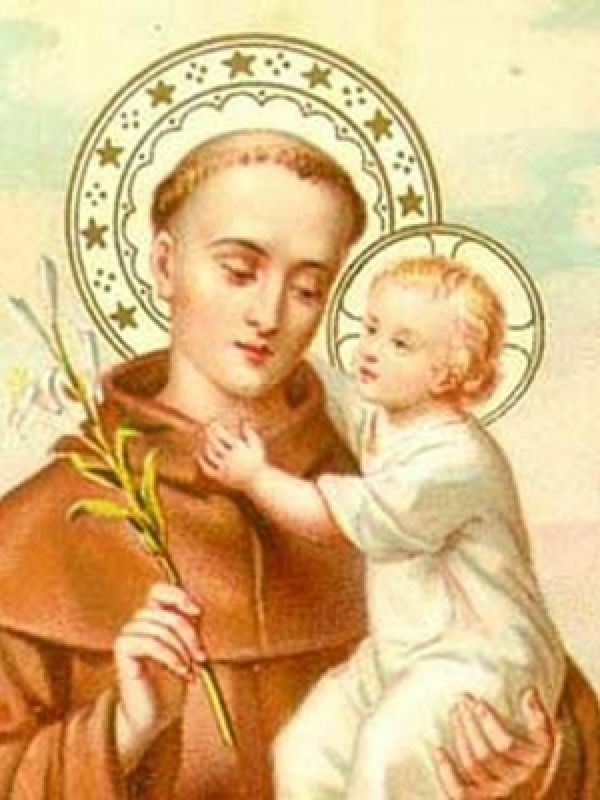 An annual procession and festival to honor Saint Anthony has continued to this day.